Amishav, the Organization on behalf of the Dispersed of Israel, was founded in 1975 with the encouragement of Rabbi Zvi Yehuda Kook, head of "Yeshivat Merkaz Harav" in Jerusalem and the spiritual leader of religious zionist Judaism. 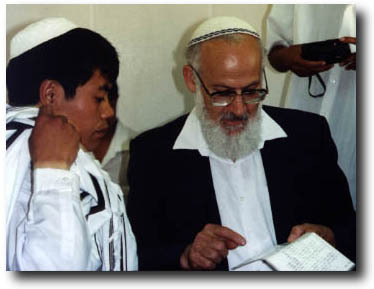 Rav Kook supported Amishav and encouraged its various activities to his last days. Photo courtesy of Kulanu Inc.
Amishav is the one of the organizations helping Bnei Menashe in India, Burma and in Israel. Rabbi Eliyahu Avichail, the director of Amishav, organizes activities from Jerusalem.